Every spring I like to do an update on our potted garden, to look back and see what has survived the winter. Each year, we're learning which plants are worth investing effort so we get as much enjoyment out of our garden as we put in. Here's a link to last year's update. 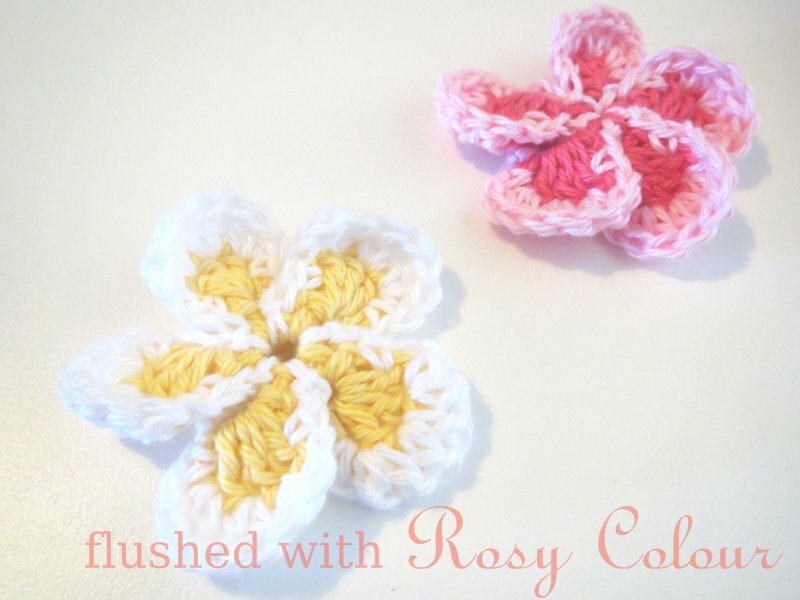 During last summer, our baby son arrived 2 months early and I was also very ill, so our garden was severely neglected. But some plants really hung in there and have perked up after some recent tender care. The pumpkin and chamomile didn't survive the winter though, and a new addition that's been a success so far is the capsicum! I still have the three bushes of all-year-round basil. The eldest just doesn't seem to want to give up, I keep removing the flowers, it keeps going on. Last summer the basil was very neglected and ended up very scrawny. I pruned it harshly, and now the three bushes are looking much better, even the eldest is still producing fragrant leaves. This is a surprise, as it must be 3 years old by now. 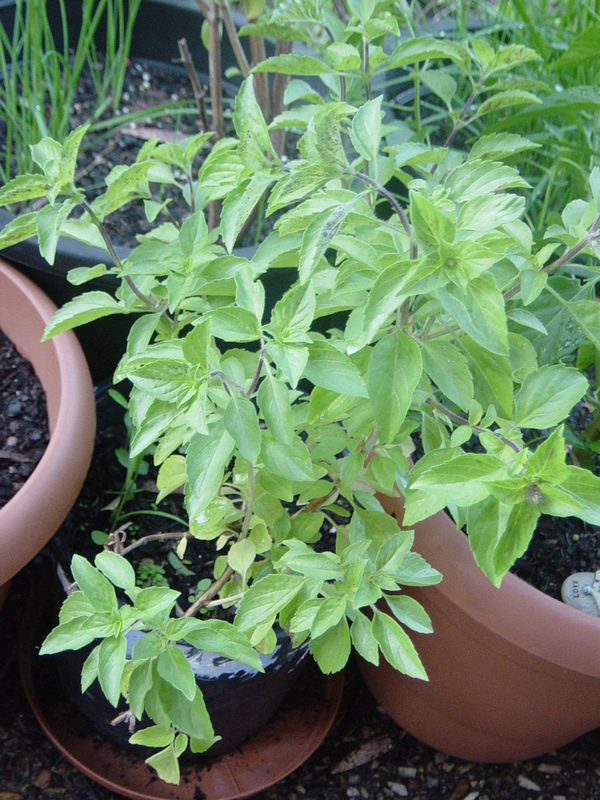 The second season of sweet basil that the landlord Rose gave me finally died, but David's father gave us some basil seeds planted in a pot when they last came to visit. These are now sprouted and David has planted the biggest of these into pots, we now have several new sweet basil plants for this season. We've discovered to keep the chillies really happy, they simply need to be re-potted into new compost rich pots every year. We had several 2 and 3 year old plants that were looking terribly miserable and sure to die, we replanted half of them and they have done amazingly in a very short time. There are 3 very small 2 year old plants left that are in desperate need of a re-pot, which we hope to do this weekend. Even when they are scrawny, they still keep producing the red fruit so we always have some for our cooking. 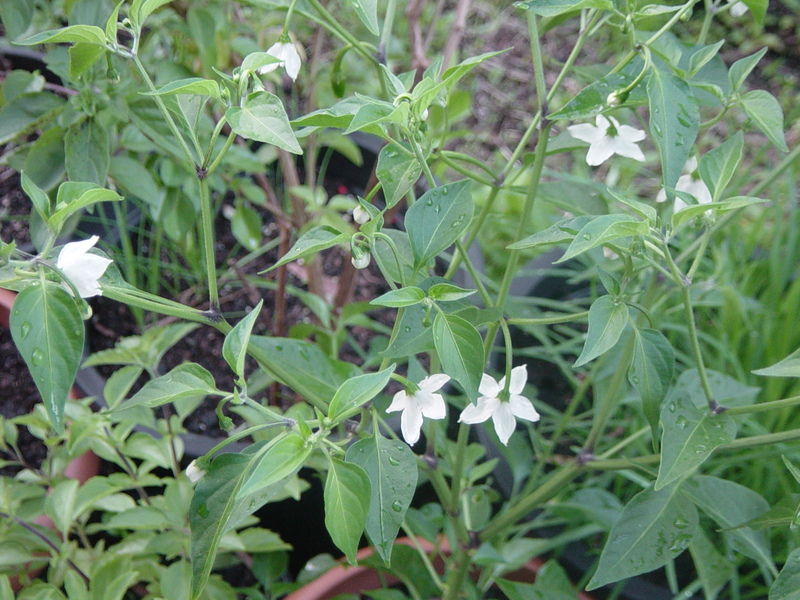 David's father gave us a new variety of chilli plant, which now has its own large pot and is doing exceptionally well and is full of white flowers. 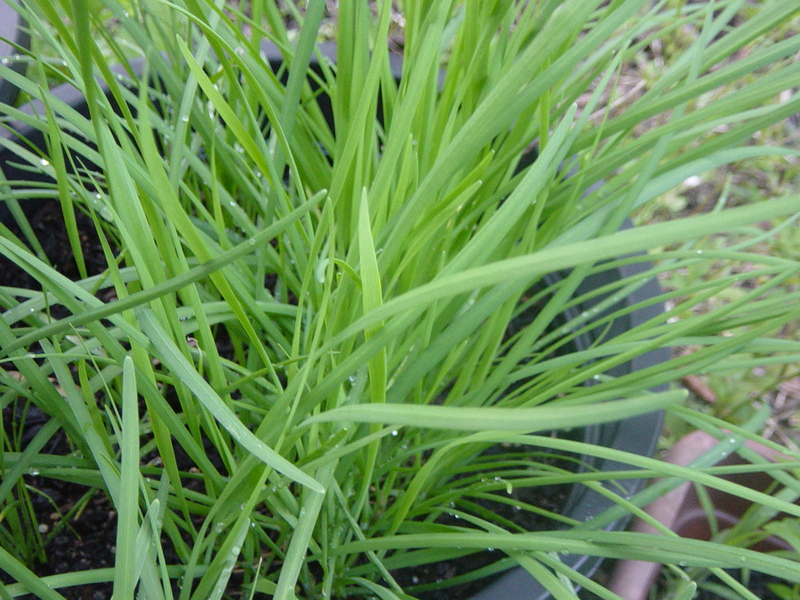 When the garden was being neglected, the chives suffered from a terrible case of a pest infestation, we think they were tiny black aphids. David had to spray them several times with pyrethrum until now they finally have perked up to their former happy selves. The problem though is that I'm guessing its because of that they haven't flowered this year. Hopefully they will flower next season so we don't loose our crop. David's father has also given us some new chives, so we should be ok.
After I pruned it last year, it has grown back and is flowering nicely, but now has some more branches growing in odd directions. It looks like it needs another prune, but I'll wait till after the summer to do that. No cuttings of this bush have ever taken, so I still have just the one plant which is now 3 years old. 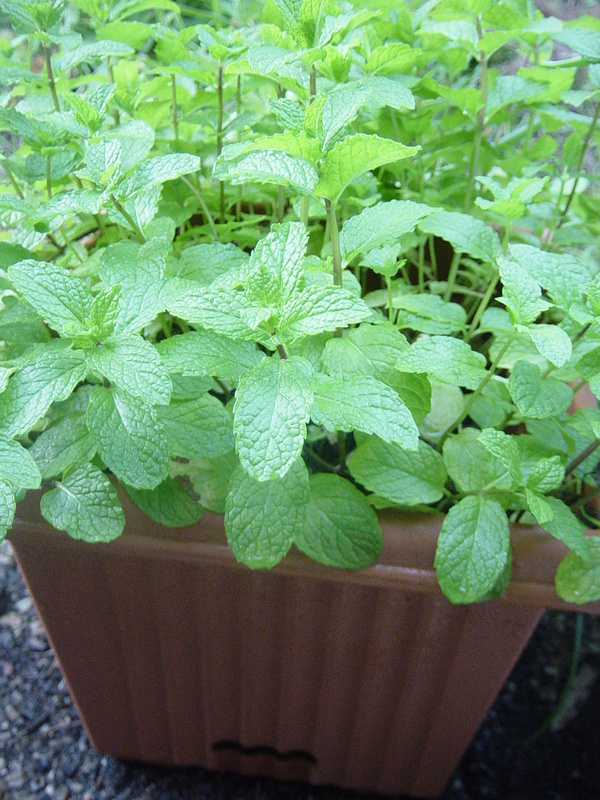 The mint was not happy at all after last summer, we lost the lemon balm and also the peppermint that was in the same pot. Luckily I had some peppermint in another pot and that is going fine. The mint looked awful, so we bought a special pot for it, a self watering one, because it really wants to be in the sun but also to be kept moist. Now the mint is doing great! These mints all used to be in hanging pots, as well as the strawberry, but we've given up on the hanging pots. They were the kind that has a coconut fibre lining which turned out be way too dry, all the moisture just seeped right out. The lining has been thrown into the garden for the birds, in case they want to use it to line their nests like they did last spring, and the metal cases are stored in the garage. Maybe one day we'll live somewhere where they'll come in handy. I don't know what to do with our parsley! Its become very thin, with just a few individual plants, it doesn't seem to be reproducing. It was supposed to flower and seed, which it has never done, and some of it is now 3 years old. David's father has given us some new parsley so hopefully that will grow a bit better. Its so sparse at the moment that we can hardly use it in our cooking. I still only have the two plants, one of each. They are looking very modest, but at least they survived last summer! They are now out in the sun with the rest of the plants. We've put all our pots where they can get rain, so no more pots under the roof. The oregano and marjoram are still in the same small pots on the shelf, which is now by the fence where they can get some sun. David's mum helped him prune the lime tree when she visited us in the summer. This spring, it has sprouted shoots all over, even in the bare section that's persisted all this time. Last season we did get a few more limes than the 3 we got the year before, and these got used in David's cooking, mainly his spaghetti and meatballs. We lightly top dressed it again this winter, as we were just not brave enough to prune the root ball. Looks like it is doing fine without us doing that! 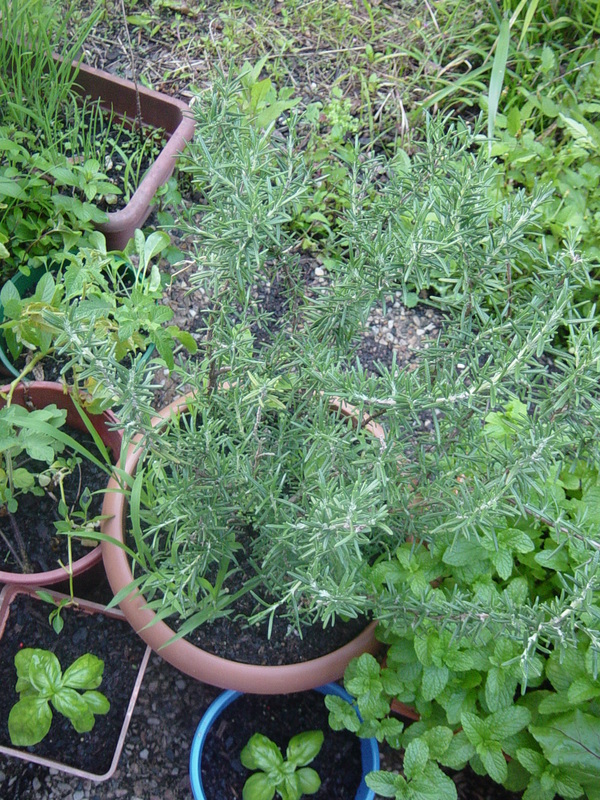 The rosemary is doing so well that I decided to invest in two new big pots for them. These plants seem very tough and managed the major neglect just fine! They were just kept in the sun the whole time, had good drainage, and didn't complain at all. Our amazing crop of rocket seeded in the winter, and we just finished collecting the last of the seeds. We have many, many seeds from the rocket now, it did so well. Now we don't have to always wait for the rocket to flower and can keep up new crops for eating. I'm looking forward to making some salads, instead of just having rocket on sandwiches. When David's dad visited us, he brought with him many seedlings from his home in Stanthorpe where he grows his own food. 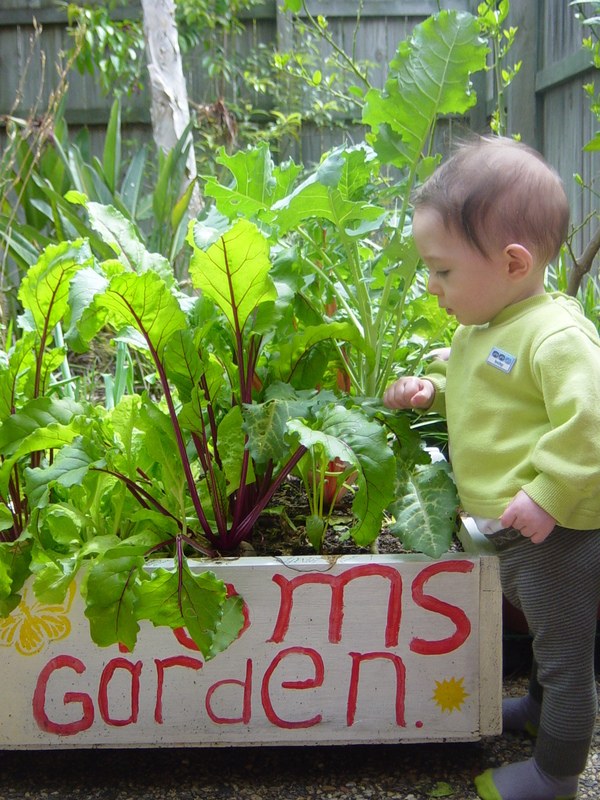 He also made a special planter box for Thomas with all sorts of plants in it, like beetroot and broccoli. There is lettuce and spinach, which we eat and there is plenty for us, as well as David has used the shallots in his cooking. 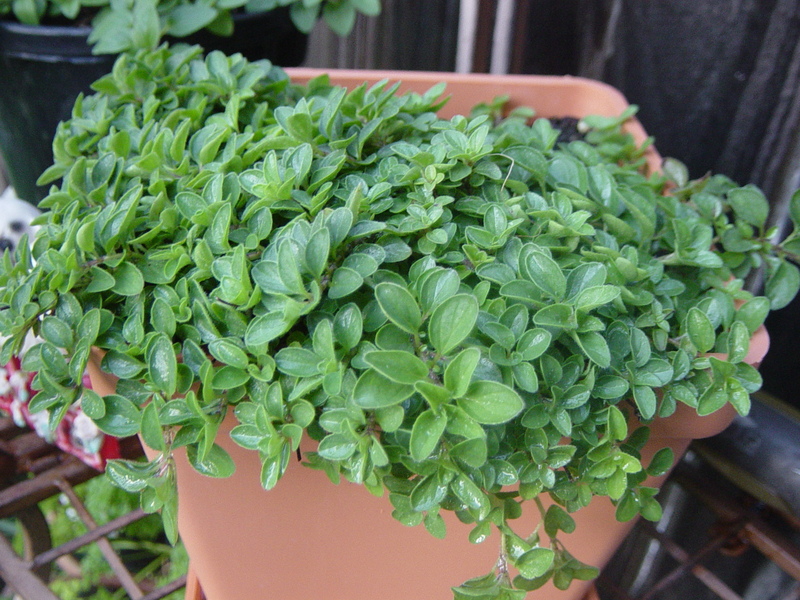 Its busting with plants right now, and is a great addition to our potted garden.